There is more to a design than a beautiful layout. The most successful campaigns, marketing collaterals, and communications are fuelled by multiple key factors that all play an important role in the overall plan and final design. Design strategy combines business objectives with a targeted approach. 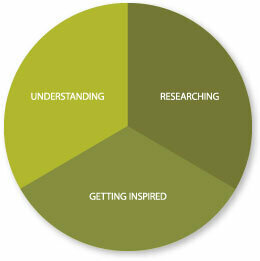 These three simple factors are an essential part of creating strategic and innovative designs. Asking for as much background information as possible is critical. Having a clear understanding of a company, their products, services, and goals creates the foundation for a design. Resources such as target audience will give you the ability to determine and define the right marketing channels, visuals, fonts, and messaging for tailored designs. Without a good understanding, you’ll find it almost impossible to create a compelling and strategic design that is targeted to your client’s audience. Research plays a very important role in design. This step ensures you are equipped with knowledge that will take your design over the top and create that “wow” factor. Reviewing competitors, industry-specific trends and emerging markets will provide a deep understanding of the industry to ensure your design speaks to the intended audience while standing out from the competitors. Ideas, visuals, colour palettes, and photos all inspire a design and ultimately come together to discover opportunities and perspective. When reviewing your inspiration board, it is key to define why each piece will work with your project. This will allow you to explain the reason why you have chosen the direction, theme, tone, and style and why it works. The inspiration board becomes an essential step in the planning stage to ensure you are prepared to start with a focused and strategic vision. This, along with research and an understanding of initial goals and objectives, creates the roadmap for a strategic design. In closing, the more you are aware of key objectives and motivating factors, the easier it is to design something that is strategic and truly speaks to the client’s audience and ultimately meets their goals.